Discussion in 'Plug-in Vaporizers' started by stonemonkey55, Oct 31, 2008. Yes the bowl has a small lip to hold the glass screen. You will just need to find one that small. Well done Lazy, you're doing a lot more than holding up the fort- you have fixed the roof, laid down new carpets, hung honey up for the bees with a bright glowing lantern, and guess what? It is a joy to watch your enthusiasm, wisdom and experience drive this thread on back into life again! You are making me seriously question whether the Vrip would fit me better than any other vape to still allow heavy medication and good clouds with my usual reactions to most other heavy hitters? I will pioneer onwards testing until I have tried enough options to be happy picking the best overall path (i.e.- vape). Man that would be a dream to realise! Session with 2 legends I have looked up to for years and gotten to know better this year which has only enriched my life. Credit where it is due I always say. Thanks bro, take care. Big love going out to Mark @ShadowVape as well if you get back here any time- as my friend Dave often says "We're cooking with gas again." pxl_jockey, Bvapst, babaganush and 3 others like this. FYI everyone and @Elflois in particular ... there is definitely a 220v version. You can contact support@vapexhale.com if you, or anyone else needs one. Morty, Alexis and lazylathe like this. I see Vapefiend in the UK has them, so it must be region specific! Great that they managed to get the 220V units working! Anytime you are over in this area just hit me up! Whissmu, Alexis, Morty and 1 other person like this. Flavor from both are amazing! The Vrip tends to hold the flavor for longer but not by much. 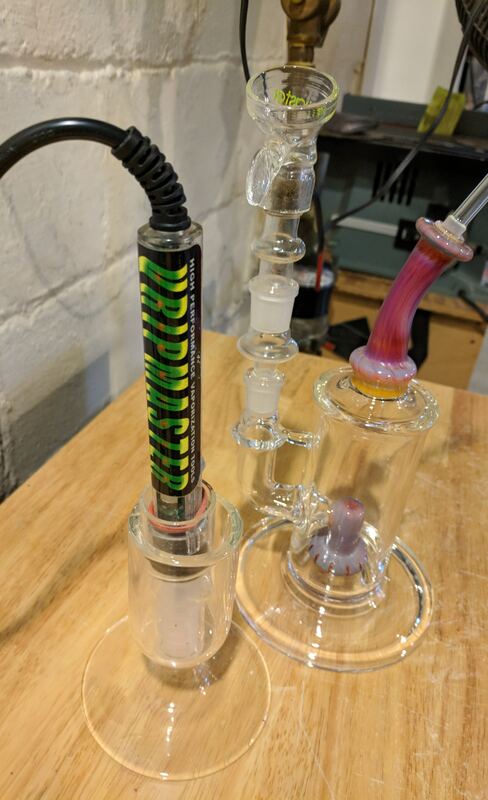 I can do whole micro loads in the FP in one hit, the Vrip i need to stir and take another hit. Nice. Speaks to the flavor of the FP if it can keep up w/ the Vriptech. The E-Nano is a great vaporizer and very robust as you say! Works with tiny loads and can be used dry or through a WT. I gave up because i could not get the vapor i wanted without a popcorn taste towards the end. A few people have mentioned this but a lot do not notice or experience it. I thought all vapes were like this till I got my SV3. It has much more of a roasted nut flavor than burnt popcorn (which I prefer). So the Vriptech's flavor stays till the very end ? Damn, I think I want one. The EVO was good at a certain temperature and anything above would be too dark and slightly below the performance was not good. If they widened the usable range it would be so much better or even added a digital display to it for repeatable sessions. This was my experience. Good info. Why I like to surf the threads. Everyone's got such different experiences. Damnit! I hate you Lazy! I think I need this in my signature at some point. Sooner rather than later. This & the GS XLR seems like they would be perfect for you @Alexis (your a dude, right ? ). I know you got a FP comin', but these 2 just scream,"Buy me @Alexis ! Vape from me"! pxl_jockey, Whissmu, lazylathe and 1 other person like this. Bvapst, Morty and lazylathe like this. After months of wait and as soon as I had the amount of money saved I ordered my VRIP with a VCB straight from VRIP. Originally I was considering only the wand since a lot of people seems to prefer to use an alternative bowl than the one offered by VRIP. Also I find that a double male-to-male 14mm glass piece connection, a 18mm female to "enlarge bowl" and a glass screen, for 80$, to be a bit pricey .. I want to write a proper review of what I think about this vape but after less than a week I'll have to stop the testings .. Since the silicone is clearly within the airpath I wouldn't feel comfortable to use it anymore ... What are your opinions on this ? Do we agree that the heated air within the vape chamber is clearly in contact with the silicone making the seal ? Did anyone else had that kind of issue ? Silicone melting/cracking ? Crack in the glass ? Did you have to pay shipping back to VRIP ? - what kind of bowl do you use ? - have you got a link for bowls larger than 20mm on top in order to fit with the wand ? I will ask more questions and write more about mods/tricks/impressions if I get a new working and safe vape to use ... But for now I feel really concerned about this ..Anyhow I still wish to use that vape and get love for it but without silicone at all ! And hopefully with a perfect positioned heater. Also do everyone else got a Vrip without some instructions of some kind ? Not that I felt so unaware of what to do, just a general question following my surprise while opening the pack and imagining other people trying to use it and set it in place safely. Happy vaping and good day to all of you ! I guess I'll have to plug back the log soon, or just get a dab ! Morty and lazylathe like this. This is interesting... I've never really heard much about this. Not a lot of activity last spring, so not a huge surprise. I'm still a relative FC newcomer. I'm going to have to check this interesting device out, @lazylathe & @biohacker are making me want to! #CanadianConspiracy? JCat, Bvapst, biohacker and 2 others like this. Hey @Bvapst, cant you use the wand with the 4.2 bowl without the silicone or does it not seal well? I dont have the vape yet so i dont know. Also would you say a 20mm bowl (from the top opening) would fit well with the wand? If you have the latest wand it should have a ground tip on it that will seal perfectly to the bowl! Very angle dependent and prone to air leaks... Hence the silicone seal. I have no concerns using the silicone ring and it does get baked onto the glass. A blade will scrape it off cleanly. Sorry to hear that your wand glass arrived broken! Morty, Bvapst and Whissmu like this. I recommend you to always watch the ceramic heater of your wand ... even if it comes to you in the correct position it can move, loosen ,,,, I recommend to watch it and place it in its correct position (well centered) if necessary as a precaution! Morty and Bvapst like this. Much thanks for your replies .. Waiting from VRIP to know what to do .. Apparently if I would intend to do any operation I just risk to break the glass and "loosing" warranty, if I'm following Mark s advices. I really dont know what to say about the silicone.. Yes I have ground tip, so it does work but like you say ..it's not ideal. Maybe some "joint" kind of connection would be more handy. Getting back to the silicone, what about if it cracks after only a few days ? No issue on your side ? If the ceramic heater touches the borosilicate capsule (the glass) it will break, so it is advisable to watch it, as simple as before plugging it in to see that it is centered! That's a bad beginning my friend @Bvapst but don't give up, this vape is amazing when everything is perfectly settled but it need a lot of care. Where did you ordered from, please? I read earlier in this thread that one would need a bowl which can fit a quarter in it for the VHW to have a good seal without the silicone (around 24mm), does this still hold true for the 3.0 version? Or can one get away with a 20mm bowl opening? I also contacted blazemaster to inquire about a custom bowl, though Im not sure if he still makes em. Sure I had and still have big hope for this vape : it's cracked and still usable but seems like the crack is getting bigger, anyway he was mentioning giving me a new one for sure, then I also wonder why I should send it back, but yeah if I don't have to pay no other choice ..
Ok, I don't have much time for review and more insight now, but I must say VRIP Customer Service was top notch ! Got a new wand without having to send mine, the new one I got is perfect and after 2 bowls nothing bad to say ..
Morty, babaganush and KidFated. like this. @Bvapst Good to know their customer service is still top notch. Ill be buying mine this week if all is well with my new bubbler coming in from China, cant wait! I'll be joining this party too. Interesting vape that I had never heard of until the recent activity. Thanks to everyone that's been keeping this thread going. Morty, Whissmu, muunch and 2 others like this. I only break out the vhw on special occasions or when I want to treat myself. Here’s tonight’s bowl - 3 hits. I was setting up my fave piece when I saw this little guy on the side and thought ‘why not?’ It makes good videos! So, I give you the VripTech Heat Wand versus the Magic Flight Orbiter! Danksta, Zow237, Morty and 6 others like this. Morty, lazylathe, muunch and 1 other person like this. Well, my glass from China came in (FC-Mod) and it looked great, that is until I cracked the perc on the ash catcher while trying to pull it out. Well, good thing the main piece is in tact, which means I can still use it for the VHW! Nice clouds! I just ordered mine, so every night is going to be a special occasion with this thing. Whissmu, duff and lazylathe like this. Zow237, Morty, babaganush and 2 others like this. Morty, Whissmu, lazylathe and 1 other person like this. caution friend driver! the glass is delicate !! enjoy your magic wand !! My first bowl after getting everything all sealed up. I'm going to turn it down a bit next time. The wand packs a punch. Two weeks ago I hadn't even heard of this. Freaking nuts. I do wish that the temp dial had clear steps on it. It's a bit of a guessing game unless you count the really tiny notches. The stars aligned when I stumbled upon this guy. Morty, Whissmu and mixchu69 like this.